Lakewood Church's one-day Go Conference for Men was a pit stop where men could refuel, recharge and renew their inspiration in order to get back on track. In a rare and candid chat hosted by pastor and author Phil Munsey on Friday, Lakewood Church senior pastor Joel Osteen and Life.Church senior pastor Craig Groeschel gave audience members a glimpse into more intimate aspects of their lives, opening up about managing their personal relationships, balancing church and family, and how they got where they are today. On his relationship with his wife of 29 years, Victoria, Osteen shared that she has helped him become the man he is today, saying, "I wouldn't be who I am were it not for Victoria." He explained that 10 years before the death of his father, the late Rev. John Osteen, Victoria began telling him that he would one day preach. Osteen said that after his father passed, he felt empowered to preach because Victoria had been telling him for so long that he could do it. "We're better together," he told the gathering of men. The Lakewood Church pastor added that respect and laughter are important in a relationship. After nearly three decades of marriage to Victoria he said, "We still like to laugh, we still like to have fun." When it comes to balancing church and family, Life.Church pastor Craig Groeschel offered some sage advice to the crowd of men and church leaders. "Design your church around your family values," he said. Although the pastor maintains a busy schedule in his effort to spread the Gospel, he limits his time away from family, spending a max of 12 nights on the road. "I will not have my children grow up and say that dad was not there for them." Similarly, Osteen admitted that early on in his ministry, he frequently overcommitted himself. "I didn't like to say no," he said. The Houston pastor ultimately made a decision, however, to turn down some events and to make more time to focus on his personal wellbeing, explaining that when he took time for recreation and exercise, it helped make him more effective. He had decided that "spending time with my family, taking care of my health — it's just going to be a priority." The ministries of the two megachurch pastors are having a major impact in America and throughout the world. 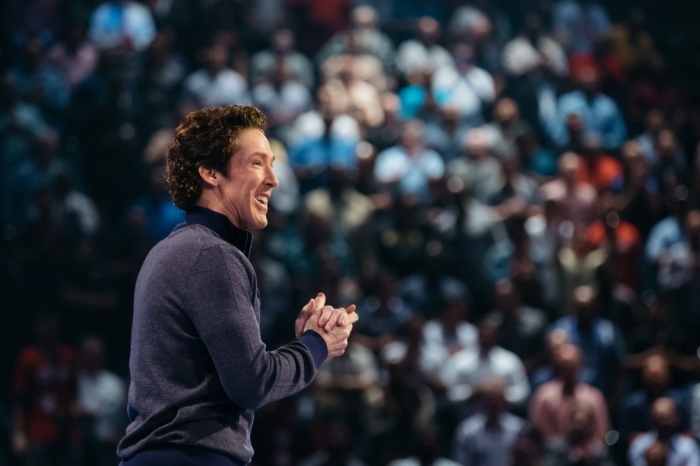 Osteen's Houston-based Lakewood Church, deemed the largest in the U.S. in 2013 according to Outreach Magazine (with a weekly attendance over 43,000), hosts televised services that air 12 different times in a five-day period across seven different TV networks, according to its website. Craig Groeschel's Life.Church ranked No. 5 on Newsmax's 2015 list of the Top 50 Megachurches in America — a list compiled based on the overall influence of churches rather than size, the publication indicated. Building Life.Church to its current level of influence required humility, consistency, and faithfulness, Groeschel said. Osteen reiterated Groeschel's point, indicating that faithfulness in ministry is key. "Being faithful where you are … I did my best right where I was," he said regarding his early years in ministry. Those years were ones of preparation, he said, explaining that there are times in life that are testing and proving times. Believers have to prove to God that they can be faithful in the wilderness, so that they can be faithful in the Promised Land, he said. Morgan Freeman Confronts Joel Osteen With Question, 'Who Is God'?